Love them, hate them, it doesn't matter - these are the tools of the trade! While there are a few RPG systems that do not use dice, most RPG players have a slew of them. Specific dice (Fudge Dice, D&D Premium Dice) are listed under their parent RPG. We are no longer adding versions to this entry. We are not listing people or company credits on this entry. d4 - A four sided die. d6 - A six sided die. d8 - An eight sided die. d10 - A ten sided die. In the 80’s a d10 was a twenty sided die with the numbers 0 to 9 twice. d12 - A twelve sided die. d20 - A twenty sided die. In the 80’s, a d20 was a twenty sided die with the numbers 0 to 9 twice in two different colors, like black and red. Often a d20 was made from a d10 by using a marker to color in one set of the number (0 to 9) to signify they were 11 to 20.
d100 (two dice) - Are used to get a number from 1 to 100. Today there are special d10 with the numbers 00, 10, 20, 30, ... 90. You roll one of these and a regular d10 to get a number from 1 (00 + 1) to 100 (90 + 10). In the 80’s, you used 2d10 (d20) of different colors and used one as the 10 factor die and the other was the ones factor to generate a number from 0 to 99.
dF - Fudge dice are made for the Fudge roleplaying game. A fudge die contains two sides with a plus sign (+), which represent +1; two sides that are blank, which represent 0; and two sides with a minus sign (-), which represent -1. 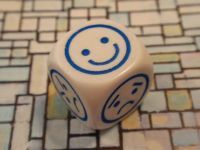 A Fudge die is functionally a three sided die (d3). While most d3s have sides 1,2 and 3, a dF has sides of -1, 0, and +1 - equivalent to a d3-2. Special Dice - There are all kinds of special dice for PRG. Here are some examples. A Standard set of RPG Dice includes seven dice; d4, d6, d8, d10, d10 (ten factor), d12 and d20. Using polyhedral dice in Fudge.